Leaves, usually termed as Gardener’s Gold, are not only used for composting. There’s actually another alternative to making good use of leaves, and that is through leaf mulching. Now, as soon as the leaves are shredded, you can immediately use this as leaf mulch, compared to the process that composting leaves have to go through (usually takes a longer time for the leaves to turn into compost). So, how do you make mulching leaves? Well, if you want to mulch leaves, it’ll be a good idea to have a leaf shredder that you can immediately use, to help save you from shredding the leaves by hand (or through other sluggish means); or save you time rather. 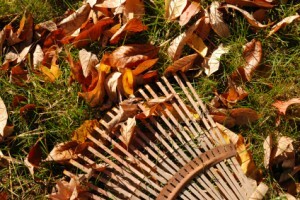 You can also consider leaf raking, as this also helps in shredding the leaves during the process. You can possibly mow them over a couple of times too if you want. Also, it’s better to use leaves that are already in a shredded state, rather than using whole ones. Whole leaves are likely to mat in the process; and takes time before it gets really absorbed by the soil. Also, this mulching process also proves to be another cost-effective option, as the leaves that you’ll be using are all free for the taking. You can probably collect as much from the ground, as soon as they fall from the tree/s. You can also consider using garden leaf collectors, like a leaf sweeper perhaps, to help speed up the gathering of these leaves. Anyway, leaf mulchers also work as a good compost material. Apart from that, mulch from leaves also helps in filling in the soil with the nutrients that it needs. Mulch made from leaves are also safe to use since they’re rarely used with any type of chemical stimulants. But using mulch in this composition also has it disadvantages. Not only does it require a lot of effort to do, it also creates a breeding ground for insect activity. Now, if you weren’t able to maintain the mulch on your garden or lawn, then it can possibly result to molding and bad odors. Of course, if you weren’t able to spread it properly on the ground, then it can also be blown away by strong winds. But if you were to give it much attention, then for sure, your trees, shrub beds, gardens will be able to benefit from it. This type of mulch can also help oppress weeds from growing any further. So it can definitely be made into an organic weed control as well. You can also keep the leaves inside a rotating compost bin as soon as they’re ready for use. Of course, this process of making your own organic fertilizer can also help you save money, so it’s that rewarding. And you’ll no longer have to buy those fertilizers in the market, or even resort to using those chemically based products for your plants and soil. You’ll be happy to know that given some time, you’ll be able to see the results brought about by your leaf mulching activity. You’ll notice soon enough (you’ll see great changes in your garden or lawn) that the mulch from leaves has finally been absorbed into the soil. Let the Lawn Sweeper help you save time and energy. 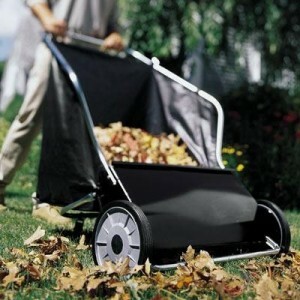 So instead of raking the leaves off of the ground, use the Lawn Sweeper as another alternative. And it’ll only take 4 bolts to assemble it! Not only that, it also features 10-inch Precision Molded Plastic Wheels, a Butterfly handle, and a Rear Swivel for easy maneuvering. It also has a removable hamper that allows for easy dumping, and also paves way for a fold away storage. To know more about the product, check the Lawn Sweeper here. This entry was posted on Friday, August 20th, 2010 at 3:34 am	and is filed under Worm Composting. You can follow any responses to this entry through the RSS 2.0 feed. You can leave a response, or trackback from your own site.